"Grateful for their tour of the pharmacy..."
Born in Maryville, Tennessee, in 1953, Mark Doty has achieved renown as a poet, memoirist, and teacher. In more than 12 books of poetry and prose he has explored the intensely personal—the illness and death of his lover from HIV—finding in individual stories a means to political and social engagement. Other poetry and prose by Doty has addressed the aftermath of 9/11 and the lives of humans and animals. He is very active as a critic and editor, with forthcoming volumes on The Art of Description and essays on "grief and the uses of art." 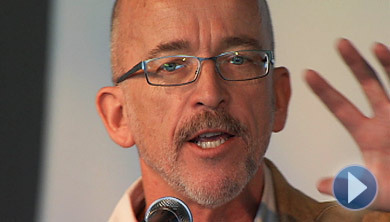 In the fall of 2009, Doty joined the faculty at Rutgers University in New Brunswick, New Jersey, as a Professor of English. To read this and other poems by Mark Doty, as well as biographical information about the poet, please visit the Poetry Foundation Web site.